The 2014 Spanish Grand Prix is on Sunday, May 11, at 7:30 a.m. EDT. The teams will have three intense qualifying sessions on Saturday before putting everything on the line this race weekend. Qualifying begins Saturday, May 10 at 8:00 a.m. EDT. After the first four Grands Prix in Australia, Malaysia, Bahrain, and China, Formula 1 finally returns to Europe for the Spanish Grand Prix. Lewis Hamilton is already poised to become the man to beat as he returns to the track after a magnificent 3-race win streak. During Friday free practice, Hamilton had already set the fastest lap in the first session with a 1:25.524s, a staggering half a second ahead of his teammate Nico Rosberg in second. Next, Daniel Ricciardo is once again the closest driver to the two Mercedes. That said, the freshman Red Bull driver is nearly a second adrift from Hamilton, clearly demonstrating that the Brit at Mercedes is in a different league. Unfortunately, the situation is even more dire for Ricciardo's reigning world champion teammate, Sebastian Vettel. Vettel's car suffered a wiring loom issue that caused him to sit out for the entire PF1. “It doesn't make it any easier for us,” explained Ricciardo, “With two cars, you get twice the amount of data and twice the amount of feedback from the drivers. Obviously, for Seb, it puts him on the back foot but it's unfortunate not only for him but as a team, as we only learned half as much as we could have today. Short runs, long runs, obviously everyone is looking at what I've done and we have no-one to compare it to. Having had a few updates this weekend it would have been nice to have had feedback from both cars." Despite the rocky start to the weekend, Red Bull did not come to Barcelona unprepared. The new Red Bulls now have tighter rear body work in the rear and have an optimized cooling set up while reducing drag at the same time. 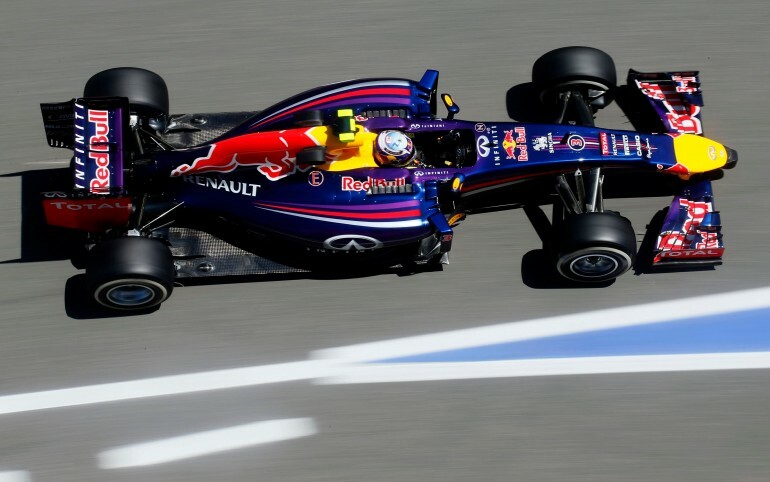 Will improved aero give the Red Bulls pace against the sheer power of the Mercedes power units. We're guessing the Red Bulls are inching closer, but aren't quite there yet. The Spanish GP qualifying session will be available on NBC Sports on Saturday at 8a.m. EDT. What's more, real-time internet updates are available on the official F1 website's Live Timing section.